Photo is current. 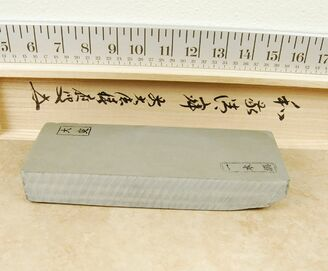 The Ozuku Asagi is a full size version of the very popular "Koppa" that we also sell. It has a very fine grain and is very hard. 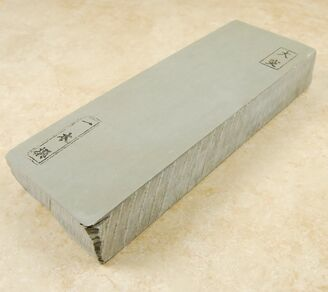 This stone is an excellent finishing stone and works quite well with razors and high end kitchen knives. Mr. Imanishi was willing to sell these stones to us recently. He grades these stones high quality with an approximate grit range of 15K-20K. There are 2 stamps on the top of each stone that are easily legible. Measures approximately 75.5mm wide by 200mm long and 34mm thick. It weighs about 3 Pounds. Very nice stone! Shipped really fast. Stone has no major flaws. Very hard and great razor finisher for me!! Beautiful stone, really makes a difference polishing the knife edge. Shipped very secure, timely delivery so I couldn't ask for more. Thanks Mark look forward to doing more business in the future. My review is a year late, but the reasoning for this is that I like to put my stones through some work before I review it. So after a year of using my Asagi, I'm happy to say that it's a very amazing stone and most definitely worth the price. First off, it's a beautiful stone, whenever I set it up in my work area and look at it, I can't help but love it. But that's just the aesthetics of the stone.When it comes to using it the Asagi gives very very excellent feedback I can just listen to my knives whenever I'm working them on the stone and I know when they're ready. It's also a very fast stone, with just the weight of the blade it polishes insanely fast. Whenever I use a nagura it's even faster. All in all I would highly recommend this JNAT to anyone who's interested in getting a relatively cheap, yes cheap they get more expensive, but very excellent stone. It exceeds my expectations .Very smooth and super fine stone .Not much to say then its perfect final finisher for knifes and razors.Needless to say, I'm quite pleased! Did not have the chance to use it since it arrived earlier than expected. That's excellent service from cktg. But the stone looks impressive. I'll try it out the soonest. This will be one of my best stones definitely just by the look of it. Very impressive stone with nice color to it & a great finisher. I wanted on awhile back but I waited too long. One was available at the time but when I came back the next day, it had sold so I found another beautiful one & after getting it, I received an email from Chef Knives to Go that they had one in stock so I purchased one as well & I'm so glad I did because when it arrived, I was very impressed. I would definitely buy from here again! They are very good to use on straight razors as well as knives. Thank you very much. 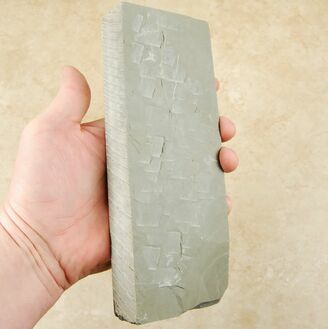 purchased this stone a few months ago now and i've had enough use to say that it is an amazing stone, weighty and stunning, creates a real razor edge on my carbon knives and is a pleasure to use, I recommend a slurry stone as it is quite a hard stone compared to some other naturals. i love my nubatama bamboo 8k but natural stones are just a whole other ball game, if you have carbons or straight razors I would recommend this stone as a finishing stone . also fast shipping from cktg as always, just over a week to arrive at my door step in Syd Australia!! Impressive and weighty stone, I've been on the road so much that I've been unable to hone any razors yet but will leave feedback again when I do. I was perfectly happy with the results from the terrific line of Chosera stones. Just to see what all the hype was about I ordered this Ozuku stone. I flattened the stone when it first came in and then sharpened a few knives to condition the surface. That's when I noticed this is a different way of life. Just a small amount of water and your sharpening, maybe a few drops more while your sharpening. No loading after break-in and conditioning!!! Instead of standing at the sink, sharping knives on synthetic stones (need the water and drain), I'm sitting at the table with this stone balanced on a pair of bar mops and a teaspoon of water. The feel of this stone is similar to the feel of the Chosera 5K. The smell is wet slate. The mud is slow to form. The stone gives a nice sharp edge (I have no idea of the grit of this stone and I don't care. It just works). I'm not skilled enough to give an opinion stating this Ozuku is or is not better at finishing than a Chosera finishing stones, but it is definitely different. Thank you Mark and Sue for spending the time answering my questions. This stone puts a very nice finish to my razors. It is very hard and heavy. Great stone.